When the water’s up, Lake Eildon and Lake Nillahcootie are a waterskiing and wakeboarding dream. Gather your mates or the family and head to the lake for a day of action. 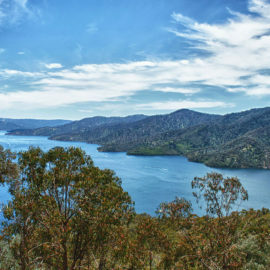 Enjoy a great day of water-skiing and wakeboarding fun on Lake Eildon and Lake Nillahcootie. Gather your mates or the family for a day of action, fun, thrills and spills on the water. With 515km of shoreline around Lake Eildon, there’s plenty of space and boats can be launched from Bonnie Doon, Goughs Bay and Jamieson. By the end of the day you’ll have blissfully sore muscles, a load of memories and a raging hunger! Head to shore for a feed and share tales of the day’s waterskiing and wakeboarding adventures. Make sure to check the Lake Eildon and Lake Nillahcootie water levels to ensure the boat ramp you’re intending to use is within access to the current water level.